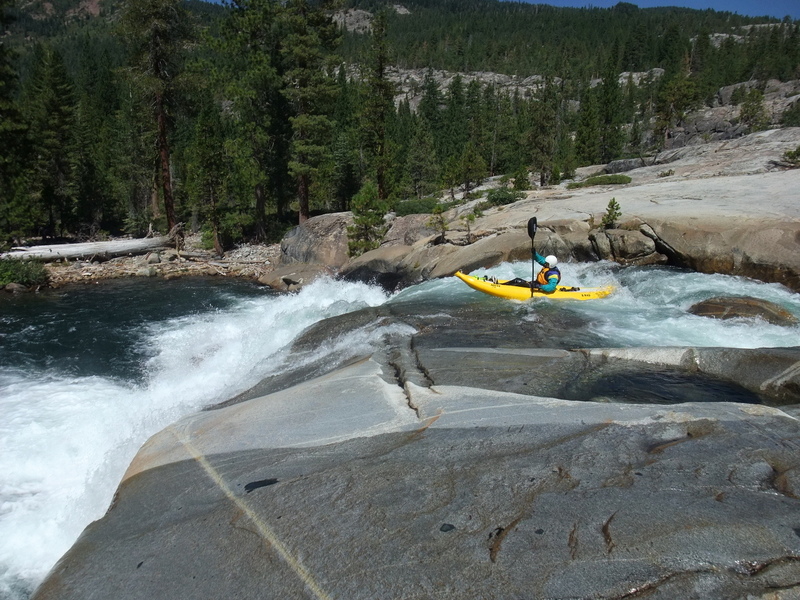 Discovered by kayakers in 1983, although probably first run long ago by native Americans, this is one of the finest expert runs in California, primarily for its excellent high-elevation granite scenery, and secondarily because it flows in summer when little else is running. The first 1.5 and last 1.3 miles are the most difficult. Down logs are an ever-present danger, sometimes shifting from week to week. 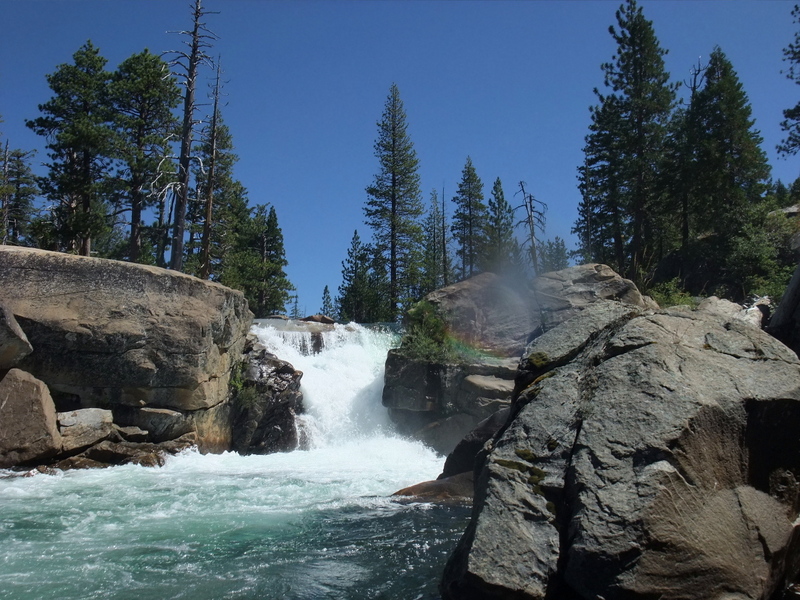 Maximum release of the dam's hydropower valve is 600 cfs. Higher flows result from spill or floodgate release. 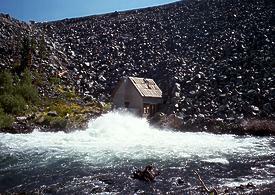 Lower flows occur as the reservoir drains down, or for Jeep jamborees. Ten miles of class V rapids and 2 miles paddling across a reservoir makes for a very long day, especially if you are one of those careful (still alive) boaters who likes to scout dangerous rapids. The best idea is to split the run into two days, camping a bit more than halfway down near Eagle Lakes. See the shuttle instructions for details. Put in at the bottom of Fordyce dam, hoping it does not rupture until after you get your boats inflated. A road traverses the top of the structure to some buildings, visible in the photo. Release from Fordyce powerhouse Eraserhead: you expect us to run that? A surging drop over barely submerged granite, with deep holes and big rooster tails. 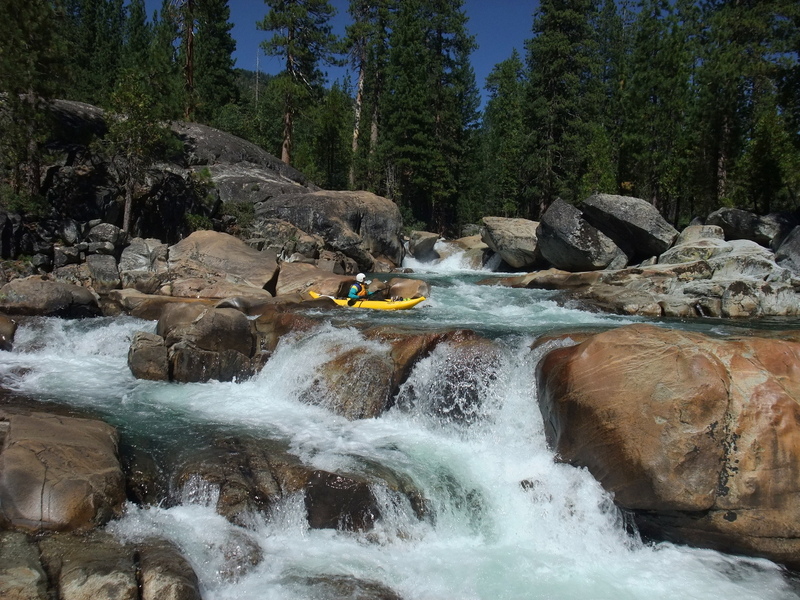 It's amazing that a relatively small flow can create such large hydraulics. Fountain, class IV, a short 7' cascade on the left. 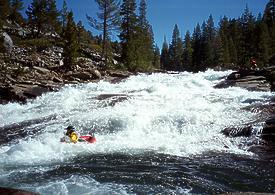 Continuous class III rapids follow. Fast and Furious, class IV, a sluice box of ledge holes with some bigger ledge holes near the end. The far left channel squeezes down to almost nothing, but a good rightward traverse leads to a relatively clean drop. 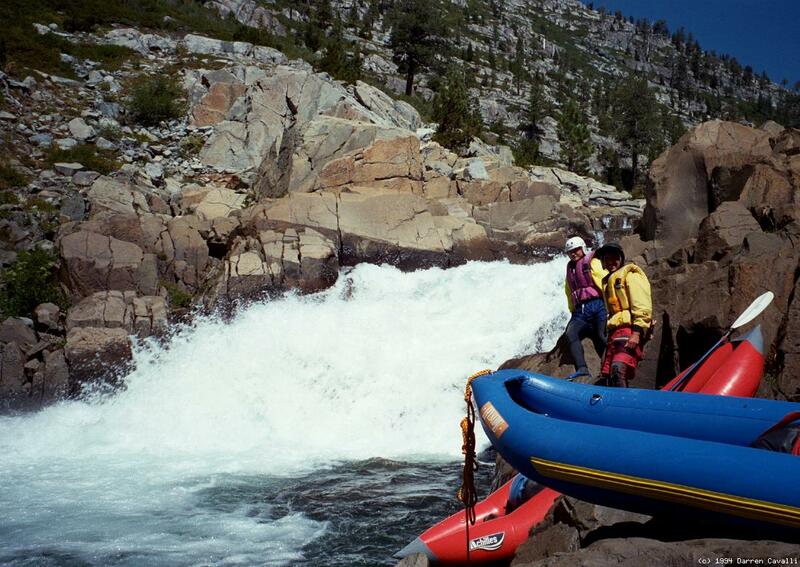 Kayakers should beware of a turbulent eddy fence below the entrance on river right. Below, the canyon opens up as Old Man Mountain towers above. 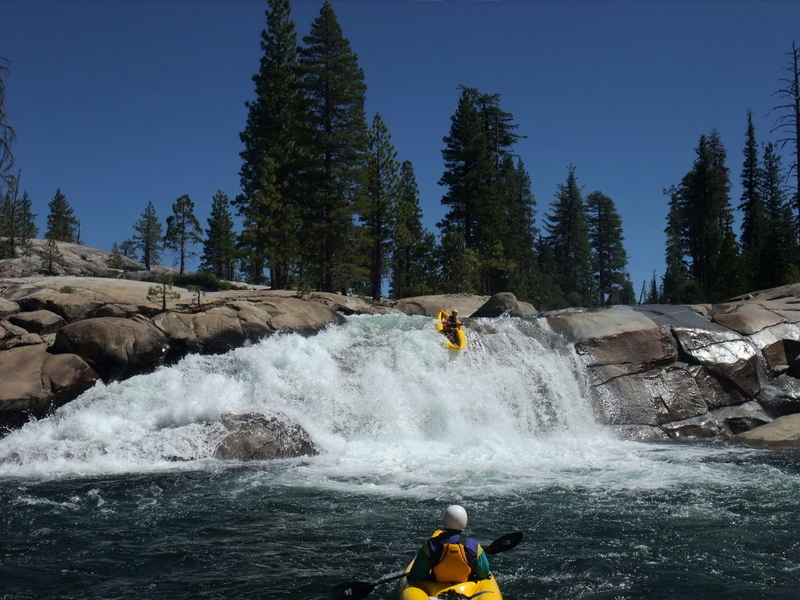 It would be hard to stay upright in this explosive falls/ramp (in Holbek's words), and there are many submerged rocks that could cause injury or entrapment considering the violent pace of the current. 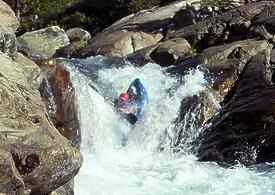 The right side drops into a rock wall, where one kayaker pitoned and broke both ankles. 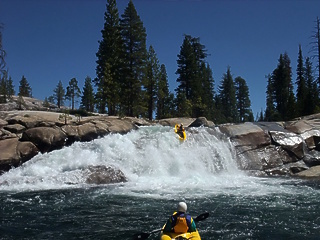 Left of center is a clean 9' drop into a pool. The river pours over a horseshoe drop into a series of rocks, where both kayaks and rafts have pinned. 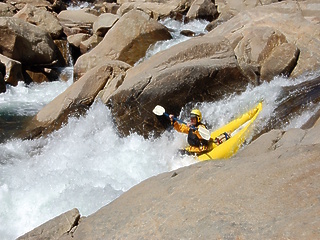 A cleaner channel on the left pours into a trough undercut on the left wall. Sneak route on the far right, which hardshells could traverse at higher flows or where inflatables could be lined at lower flows. Tailstand, class IV+, a 6' high river wide drop among boulders, the entrance of which closely follows Bishop's Balcony. Mini Gorge, class IV to IV+, after a small pool, a series of ledge holes beginning at a sharp left bend. The current forces boats into a pyramid rock. When the river bends left again, proceed cautiously. 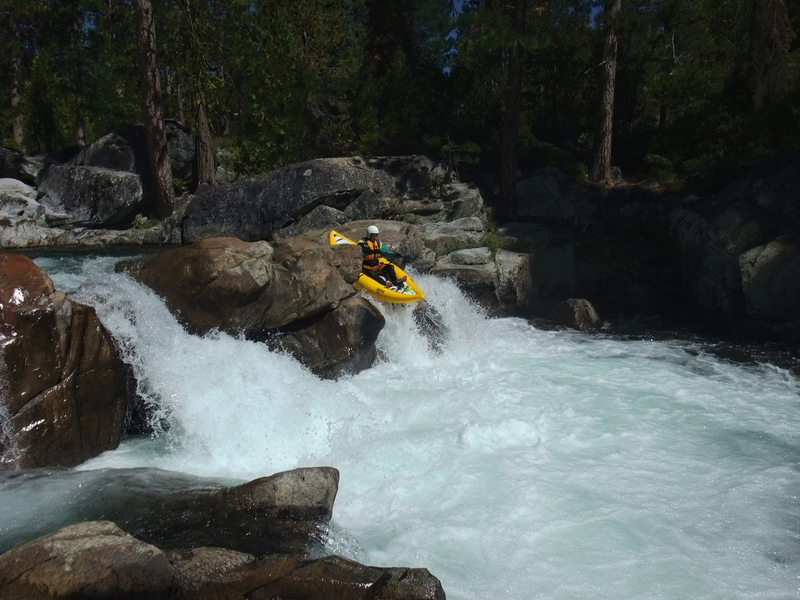 A 20' waterfall so named because hardshell kayakers often dislocate shoulders in the turbulent bottom, less of a problem with inflatables because they do not tend to bury as much. 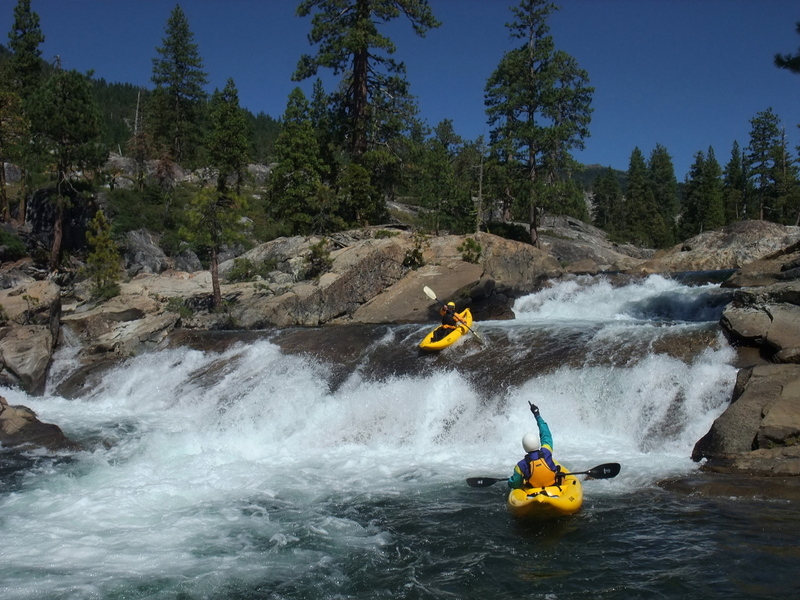 Even the entrance drop is difficult; you might want to start facing upstream from a kayak-wide rock eddy on river left near the top. 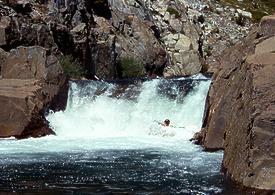 The force of current speeds you over the falls into the hole below, which is not sticky and has a good recovery pool. Often a left-to-right angle and ferry is advisable. Boats usually flip counterclockwise, contrary to how the water looks. This boat almost flips in a rooster tail! Autobahn, fun class III action. 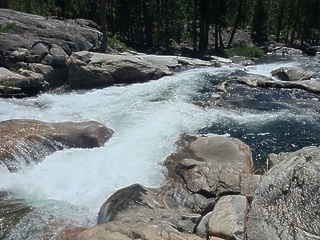 The river makes a sharp U-shaped left turn, and twists thru a series of ledge holes. The current likes to force boats into a pyramid rock. A 12' falls into a deep hole sends kayakers almost to China, from where buoyancy might squirt you back out! Boof right, staying out of the recirculating undercut on the left. After a long scenic section, the current leads along the right wall into a hidden V-shaped crack. 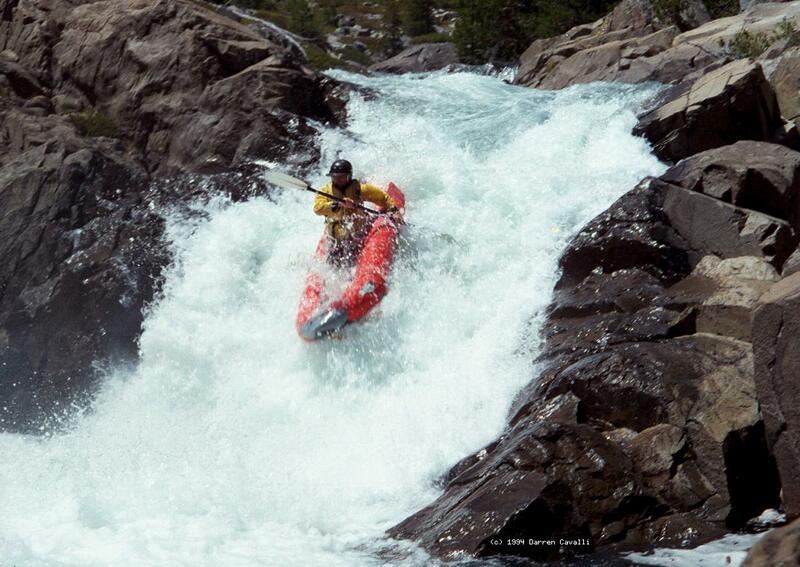 Kayaks can cross a boulder picket fence, but rafts must make a difficult left move at the brink of the crack. 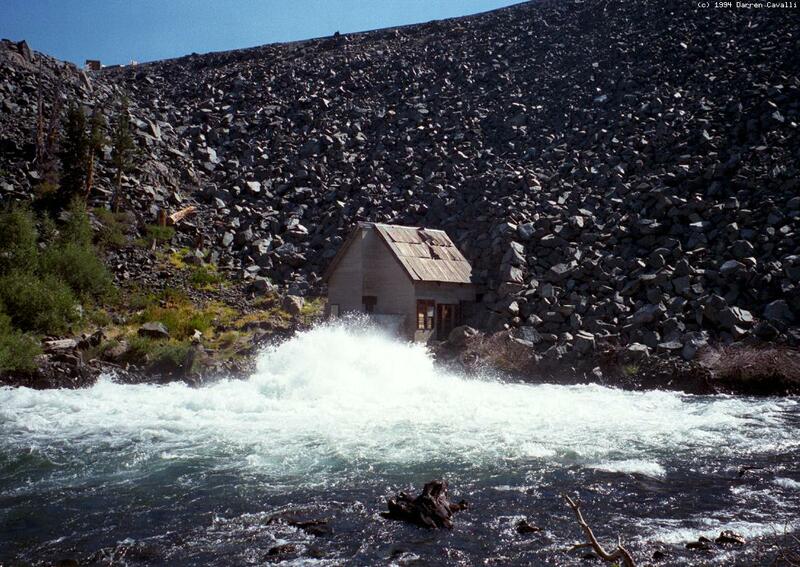 The water constricts between a granite wall and a house-size boulder. Boats wider than 74" must portage. 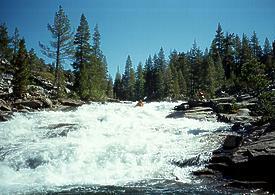 Just below is a magnificent pool with a great campsite on river right. 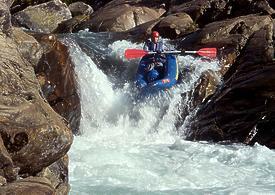 Limbo Log, class IV-, in the midst of negotiating a rapid, just below where a 4WD trail crosses the river. 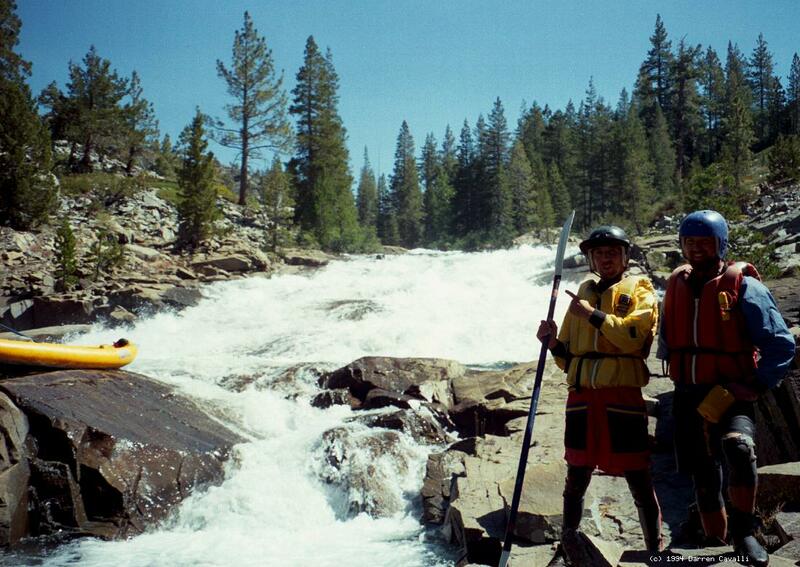 In 2002 the limbo log fell down, necessitating a short portage. 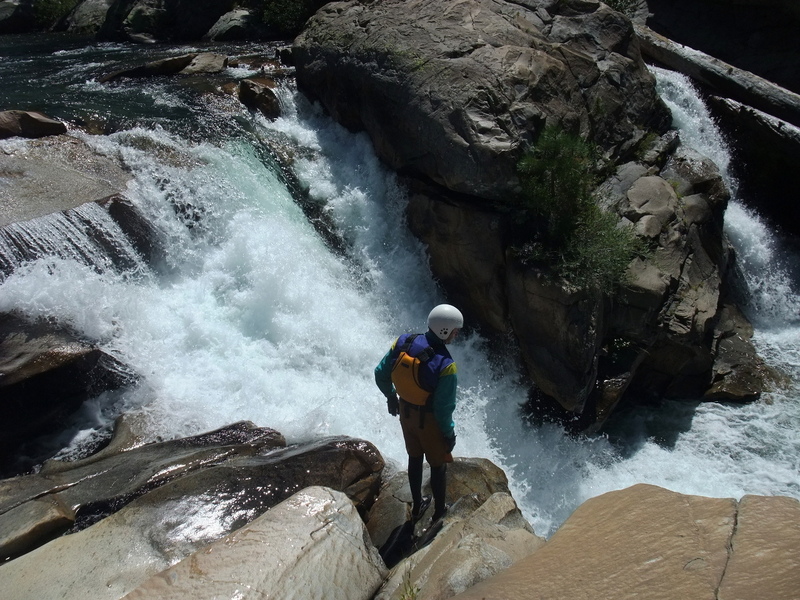 Stay right in the falls below. After a long scenic section, the river splits; most current goes left, as you should. Eddy out on the right where the channels rejoin. Below a steep drop, the creek narrows down to a meter-wide slot. 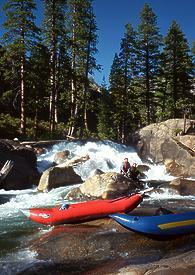 Although initially considered a portage, kayaks often run it now. Rafts and fiberglass kayaks should definitely portage! Portaging on the right is easiest if you go around the granite dome. In 2002 a tree had fallen and a large log remained in the drop. Lost+Found, class IV-, where the 1997 flood short-circuited a U-turn by choking it with logs. 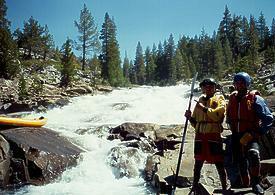 High water during 2002(?) appears to have returned this rapid to its previous condition. The river drops 6' over a ledge angled 45° to the current, while less water folds in from the left. This folding wave formation is bad enough, but is followed by a boxed-in hole and a huge undercut cavern. Be sure to set safety in case of swimmers. In recent years a jammed log on the right makes this drop virtually unrunnable (2002). Easy portage on the right, with possible seal launch. 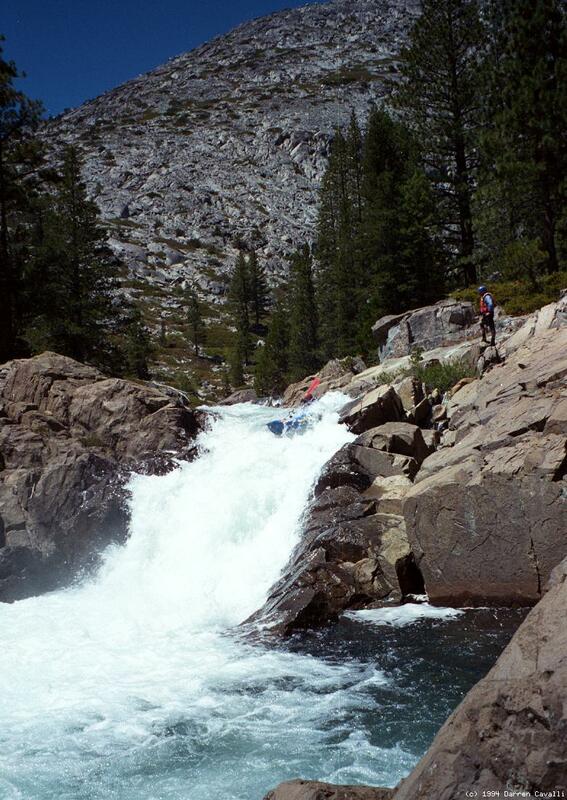 A mess of big boulders in a tall steep drop act as a log strainer; even if clean there are few viable routes. Possible seal launch below. 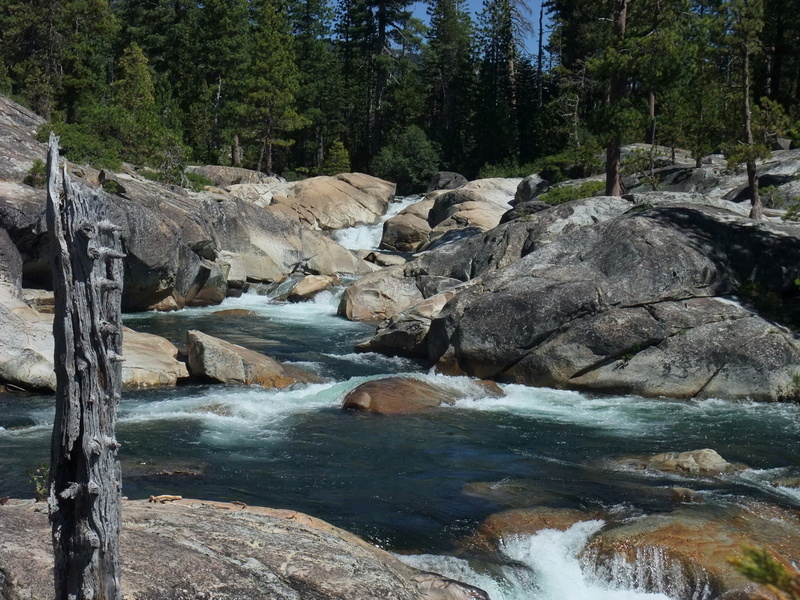 Hiking footbridge, concrete and green metal, and trail to Eagle Lakes. 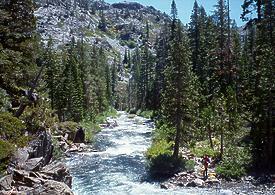 A hiking trail leads north to Beyers Lake. This is a good place to leave your boats overnight and camp at vehicles left near Eagle Lakes. 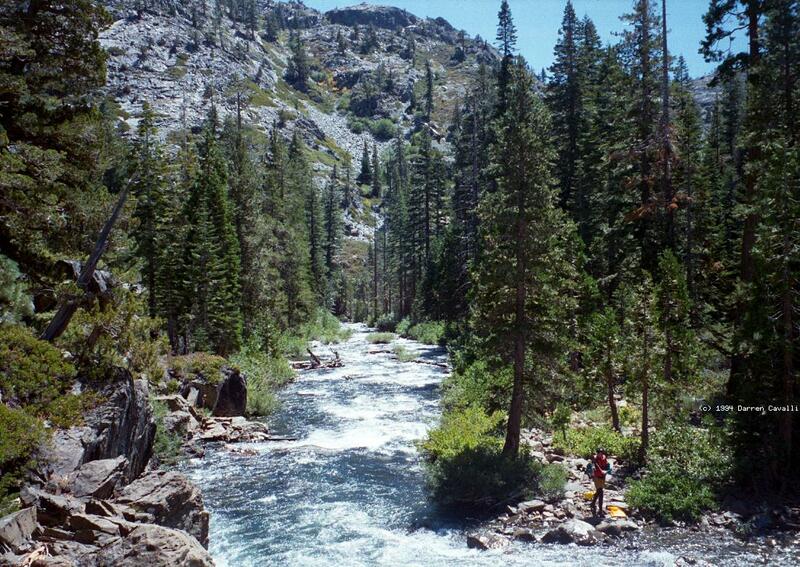 Take the right channel where the river splits below. 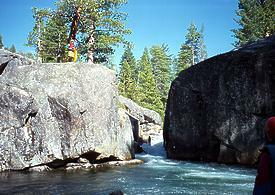 A long technical boulder slalom over and around a series of ledges, with easy eddy hopping, and ending in a large rock/hole combination. Pierce Meadow Trailhead. 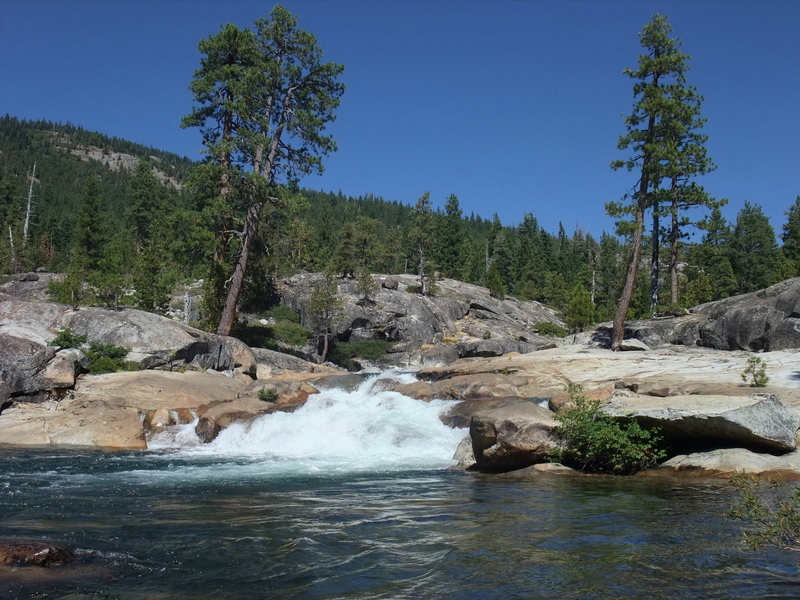 This is another place to leave your boats overnight, and hike up and downhill about 3 miles to vehicles left near the South Fork Yuba. There used to be a 2WD road to Pierce Meadow over private land, past an A-frame cabin, but it was torn up (2010) to prevent motorized access. 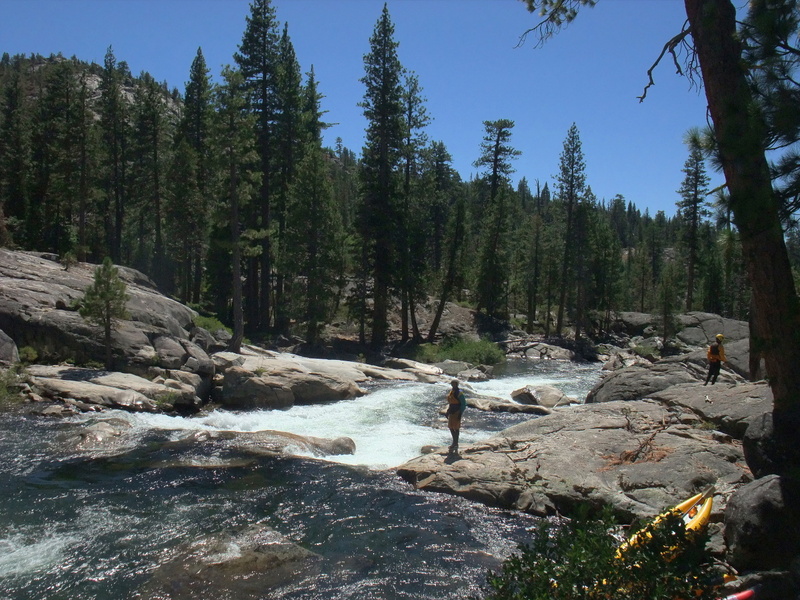 Easy water for a while, past good camps accessible by trail on the right bank. The second of two ledge drops has undercuts at each corner, so boats can get surfed like a typewriter carriage side to side. The creek is extremely scenic in this section. The bulk of the current traverses rightward, falling gradually off a ledge, into a big boulder on the right. You can pick an exit point where there are no submerged rocks at the bottom. Named after a rafter who struck and injured his face on a crewmember's helmet. Unnamed Drop, class III+, an horizon line and 10' ramp below a split in the channel. 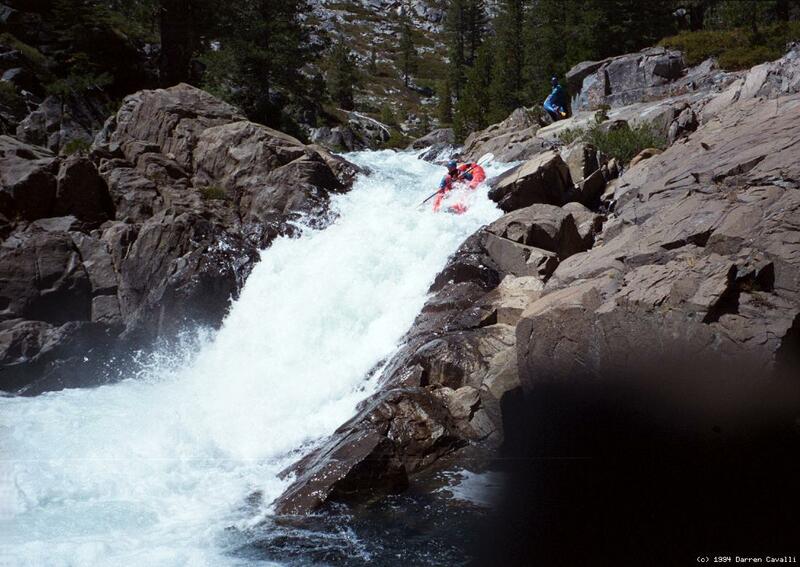 A 25' falls that has been run, though not always successfully. 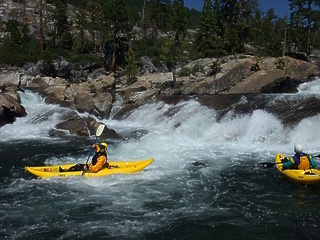 Narrows, class III+, where the river constructs thru a narrow chute. A small creek enters on the right at a hard left bend. 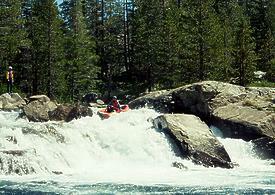 The river plummets 20' down an undercut and boulder-choked chute ending in a river-wide hole. Portage recommended on the right. The scenery borders on unbelievable. 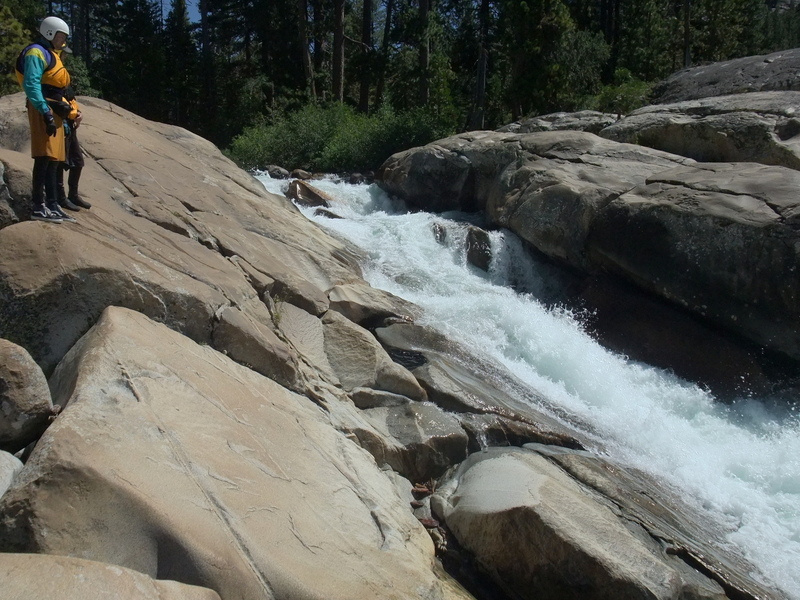 A treacherous entrance with knobs of granite protruding from the riverbed, causing great pinning or pitoning hazards. After an entrance hole and some boulders requiring precise maneuvering, the current drops down a ramp into a hole, trying to push you into the right wall. The second drop is a fun granite slide, followed soon by a rocky multi-channel drop. The first drop is meaty at high flow and narrow at low flow. 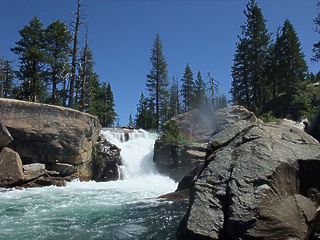 The second drop has a nice waterfalls on the far left. 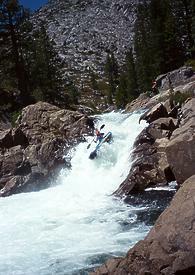 Two separate jumbled drops are separated by a short section of fast water. 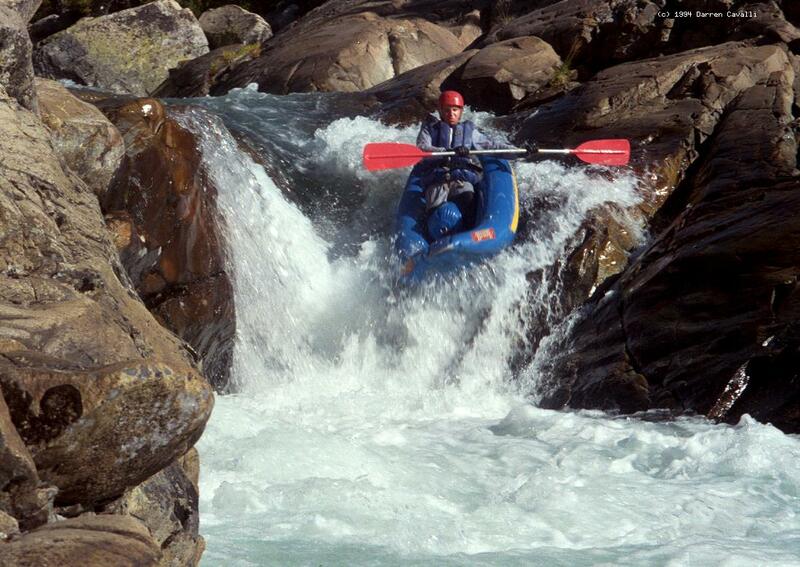 Named after a kayaker who disappeared temporarily underwater in the second drop. 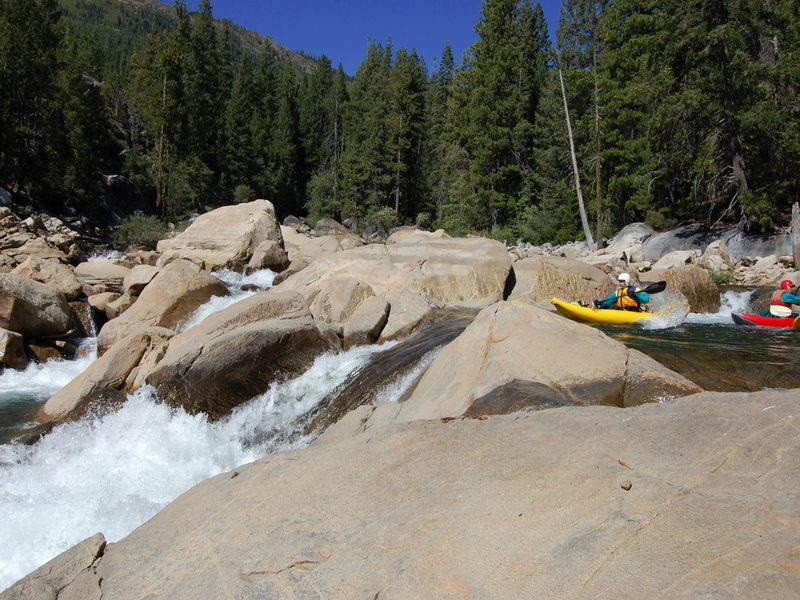 After a calm section, a granite outcropping appears on the left, and huge boulders block the river. Named after the one required precise (and strong) paddle stroke. The flood of 1997 made available an alternate sneak route. Work back and forth to find a good route. An irrigated boulder field, followed by a granite wall on the left, forcing the water to bend sharp right. A portage trail starts on river left just before this granite wall. In the next .1 mile, the river plummets 40' thru a boulder jumble. High water mark of Spaulding reservoir. When the reservoir is low, some good 8' to 10' drops appear. Take out on the Spaulding reservoir boat ramp, south of the dam. To reach overnight camp at Eagle Lakes, take I-80 to the Eagle Lakes exit, just west of Cisco Grove. Cross the South Yuba river, curve left, and pass the entrance to Indian Creek campground. Before crossing the river again on a concrete bridge, turn right onto a dirt road. Soon, after the Indian Springs 4WD staging area, this road may require 4WD in spots. After about 1.3 mile you reach a Y intersection. The right branch leads to Eagle Lakes, the left to Pierce Meadows. To reach put-in from there, return to I-80, and drive a short distance east to Cisco Grove. 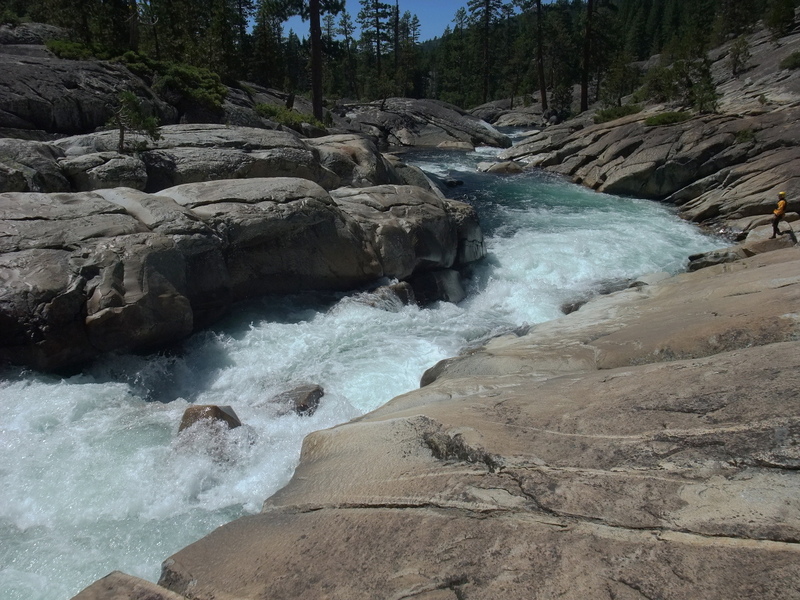 Cross the freeway and the South Yuba river, then turn left at a stop sign. Within 200 meters, turn right onto Fordyce Lake [sic] Road, just before the entrance to a private campground, closed due to Bubonic Plague (2002). Drive 5 miles uphill on a good dirt road to a summit. Continue downhill, where the road worsens, but does not require 4WD (2002). 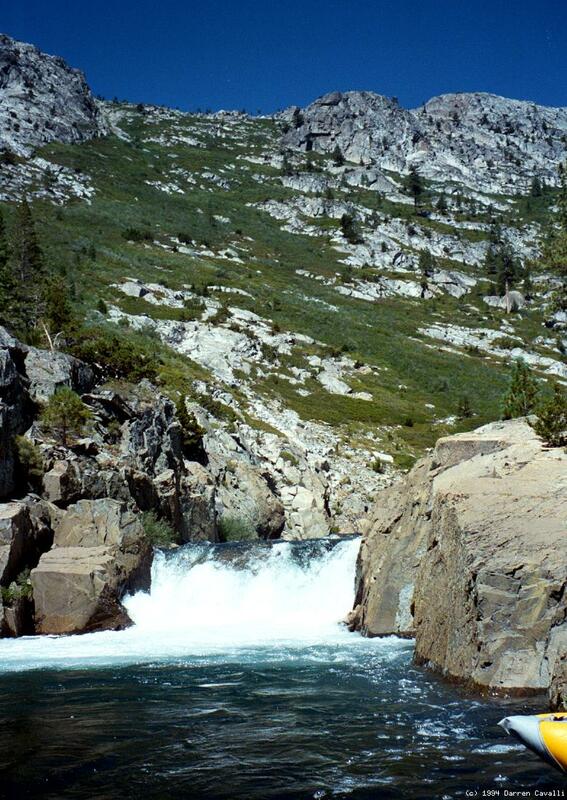 Before the rock-fill dam, turn left onto a rocky plateau above the creek. To reach take-out, take highway 20 northwest from I-80. After 2 miles, turn right onto a road marked “Lake [sic] Spaulding” and drive about 1 mile to a parking lot overlooking the boat ramp.